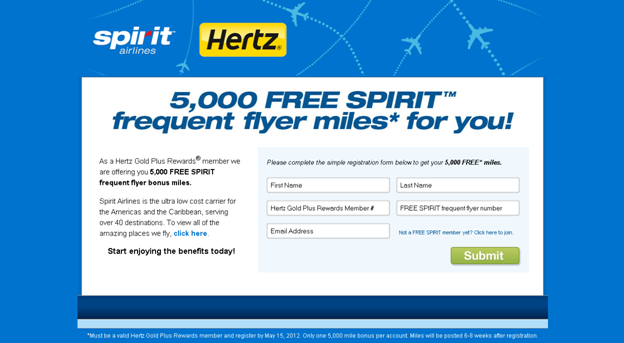 Spirit Airlines (yes that Spirit, with quite the sense of humor) is giving away 5,000 Free Spirit frequent flyer miles, to Hertz #1 Club Gold status members. Just register via this link, by May 15, 2012. Per the Terms & Conditions, the miles will post within 6-8 weeks. While Hertz #1 Club Gold status is a comped benefit of the American Express Platinum Card there is currently an even easier way to gain it. Through April 30, complimentary Hertz #1 Club Gold membership (a $60 value) is available. Am I crazy about miles and points, especially when they are Free? HECK YES! Am I crazy about Spirit Airlines? No, not really. But as AlwaysTravel commented, this is enough for round-travel within the same region, which could potentially come in handy in a pinch. Sure they may nickel and dime (or nowadays Lincoln and Hamilton) you for baggage and food, but if the ticket is dirt cheap who really cares? Hat tip to Mr. Gary.